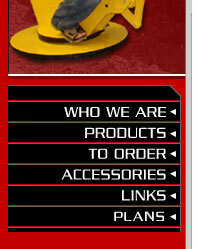 Way Cool Kits has put the "family" back in "fun" with a roster of easy-to-build kits. Our Soapbox Go Karts race in derbies across the continent and have a reputation for speed, durability and ease of assembly. In fact, every one of over 500 kits shipped is racing in Hobby Class, Hobby Pro Class or chasing the family dog down the driveway. The Way Cool Push Kart harkens back to the days when kids made their own fun. Not being gravity dependent, these karts promise hours of do-it-yourself fun for kids and parents alike. For Cubs, Scouts or community groups both the Push Kart makes an excellent project. We have special pricing for 5 or more kits. The Backhoe makes a construction worker of kids from 3 to 10. Rugged and practical, these remarkably designed machines really work. Watch the video and see Graham move some serious dirt. 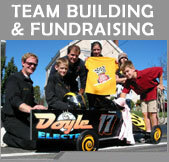 More and more our kits are being used in team building seminars, fund raisers and school projects. See what else waycool kits are used for.